People generally bring their animal to an animal chiropractor because something about their companion has changed. They may be avoiding behaviors that used to be commonplace. Perhaps the dog is no longer jumping onto the couch, or bringing toys to their owner to solicit play. The cat isn’t using the litter box properly. Or, the animal may be showing more obvious signs of pain or discomfort, such as loss of appetite, limping, lethargy or hiding. 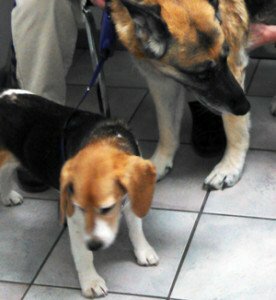 Two dogs prepare for a chiropractic checkup with Dr. Annie Seefeldt. An owner’s or handler’s perception of change in an animal often occurs long after the change has already begun. Interpretation of an animal’s pain level is difficult at best. Objective evaluations of soundness vs. lameness show varying results, even among those considered to be experts in the field. So don’t blame yourself if you didn’t spot your pet’s discomfort right away! Dogs and cats are animals that live in social groups in a natural setting. They are hard-wired to hide ailments and discomfort. By the time the untrained observer is noticing a change in posture or gait, the pain is likely so severe or chronic that the animal simply cannot mask it any longer. At Chiropractic for EveryBody, our animal chiropractors are trained to examine your dog or cat for the less-than-obvious signs of pain or compensation. Please visit our pages on chiropractic for cats, and chiropractic for dogs, for a more comprehensive list of symptoms our doctors have successfully treated. We consider it an honor to help your companion and look forward to meeting you both!